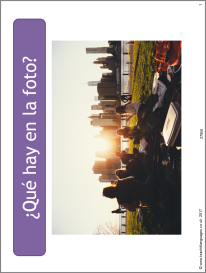 This PowerPoint will help students structure a description of a photo, giving details of the people, activities and location as well as opinions. Suggested phrases are provided along with a model answer. You could then choose a selection of other photos online on any topic for students to apply the same approach. I really like the grids with the useful language that they can use with any photo!